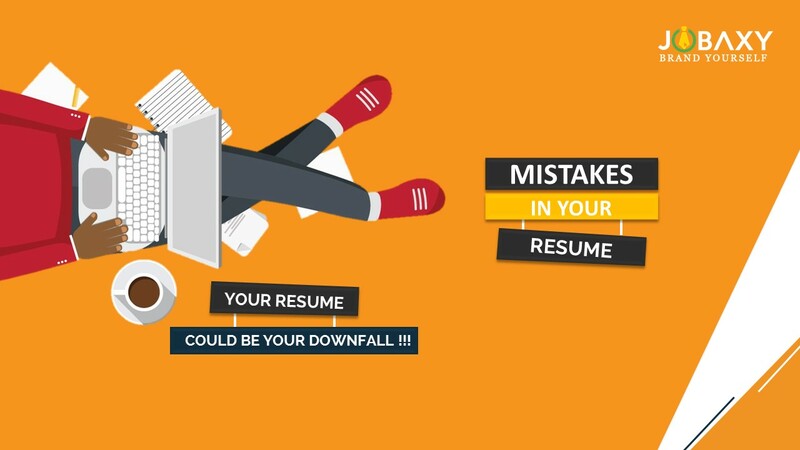 Mistakes in your Resume | Jobaxy - Brand Yourself ! Your Resume Could Be Your Downfall !!!!! Have you ever imagined that your resume could deprive you of the dream job you have waited for? Yes, your resume can lead to your downfall. Blunders in your resume can be a spoill sport, preventing you from the interview and ultimately the job, in-spite of you fitting the bill perfectly. Your resume is your selling point. It is your tool to stay alive in the competition. The resume should be crisp and tempting enough for the recruiters to give you a call for the interview immediately. Job seeker, your resume is your first impression. Thus it should speak well of you, should be formatted well, giving a glimpse of how professional, accomplished and organised you are. Outdated formats lower your chances as the possible candidate for the position. Many a time job seekers tend to float a single resume for a different industry which is a major blunder. It is a good practice to have an industry-specific resume. The resume should contain industry-specific keywords that tell the employer about your expertise at a glance. Keywords positioning is also crucial. The keywords should be placed preferably in the top section of the resume, which is easily visible to the employer. Length and text density of your resume again could be tricky. The resume should not be too long or too short, both the cases you are out of the race. With a long resume, you tend to lose the audience and a short one you may seem under qualified. The text should be such that it demonstrates your ability matching with their requirements, increasing your chances of the interview call. A perfect resume is what you need for the dream job. What if you can send an audio-video resume that restrains you from committing any blunders? A new concept altogether it is a hot cake in the market. Here the employer doesn’t need to sit and read through your resume. He can listen to it anytime anywhere, which undoubtedly will help you get noticed and stand out in the competition. By using a well-designed video resume, you can present your skills and experience in a unique way to the recruiter thus increasing your probability to land the dream job. Jobaxy offer the new-age audio resumes, most sought after, latest tool for tools for meeting today’s smarter hiring needs. Jobaxy will help you design a perfect audio-video resume that can land you in your dream job.